Robert Goulet sings a boring, but booming, “Do You Hear…”, and then he and Crosby do an extremely odd extended song/sequence based loosely on an O’Henry story. No, not Gift of the Magi, another Christmas O’Henry story. It’s really surreal: Crosby plays an oddly colorful hobo. Mary Costa (best known as Princess Aurora) does a perfectly fine “Carol of the Bells”, in a lovely sparkly dress that matches a lovely sparkly set. Crosby and Costa do a pretty actually good Jingle Bells duet. I absolutely love that she can switch from high opera to country twang at the drop of a hat. Rock on, Mary. That’s followed by an actually kinda cute Santa number complete with terrible Christmas puns. It’s the kind of corny number they might have done on the Muppet Show, and in that spirit, it’s fun. An actual professional choir shows up, only for Crosby to talk over the middle of their song. (Also, the camera angle makes it look like one of them is sitting in the fire.) 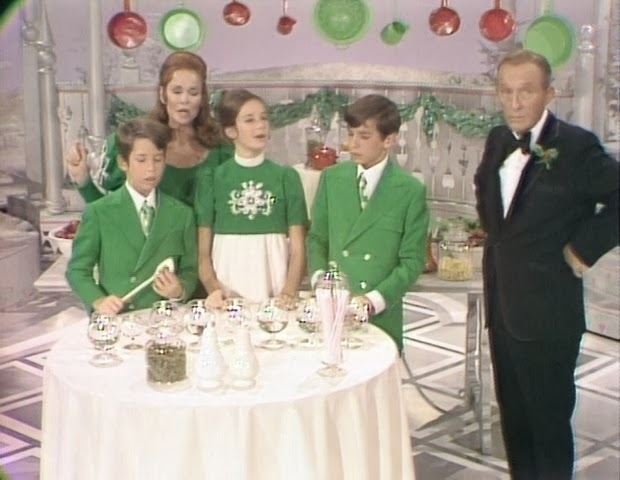 There’s another extended medley of carols, and then a slightly awkward joke about the fact that Crosby won’t let anyone sing “White Christmas” with him, but of course he does in the end. Know what you’re getting into if you watch this one, but I think it’s weird and unique enough to be worth seeking out if you like older Christmas music or vaudeville-inspired work. I love it! I remember watching this as a kid. It's cheesy, but I love. Better than anything else on tv these days. Hmmm, I'm sorry...is it Lindsay? I'm guessing that you weren't even born in 1971... of course, it's actually a stretch to assume that you were even born. So, all-knowing that you are, what would you have done, given the year 1971 and everything that had transpired that year. If you weren't so obnoxious, I'd actually pity you. Hmmm, I'm sorry... is it Dudley? I'm guessing you didn't read the entire review Lindsay wrote, which was mostly positive and finished by recommending the special to fans of the era. Also, for the record, Lindsay and I are ageless; as old and wise as time itself, with a vision beyond that of mere mortals, such as yourself. If I were still capable of human emotion, I'd actually pity you. Happy Holidays to everyone except Dudley.